Entering the real estate market is a bold move, especially for those without previous experience in managing or operating rental properties. Mistakes are common and profit is not guaranteed. However, location plays a vital role in first-attempt success rates. Before deciding on a potential investment location, consider trends in both property purchase prices and current rental market strength. Taking into account median list price, sale price and rental rates, these five markets prove profitable for new or seasoned real estate investors. 1 Atlanta, GA Atlanta is experiencing a growth period, making it ideal for investors to buy before home prices peak. The median listing price for homes in Atlanta is $200,000, yet the sale price is slightly higher at $228,650. Homes selling for more than their asking price indicate sellers have the market advantage due to strong competition amongst buyers. Entering competitive markets with a restricted budget can prove difficult, especially without prior negotiating experience. Although home price data benefits sellers, Atlanta’s median rental price is $1,253. Apartments in the greater Atlanta Metro region, on the other hand, have a smaller median rental price of $1,100, indicating landlords can charge steeper rents on properties closer to the city. According to Zillow research, profitability of Atlanta real estate investments is expected to increase over time. 2 Dallas, TX Compared to Atlanta, the median list price for homes in Dallas is higher at $259,200. But, Dallas’ median sale price drops to $245,371. Unlike Atlanta, where sellers benefit from buyer competition, Dallas’ market indicates room for price negotiation. This leverage is especially important for new investors on tight budgets. They have the opportunity to purchase quality properties – with higher rental rates – at lower price points. Median rents in Dallas are $1,275, which is below the national market value of $1,500. Keep in mind, however, national rental rates incorporate inflated cities such as New York, San Francisco and Los Angeles. So while Dallas rents aren’t astronomical, investors eliminate the need for large loans and can pay off their mortgages sooner since sale prices are low. 3 Memphis, TN The median list price for homes in Memphis is $149,900. Bidding wars might be present in the region, considering the median sale price is $162,015. Compared to the entire nation, these properties are still very affordable to buyers. 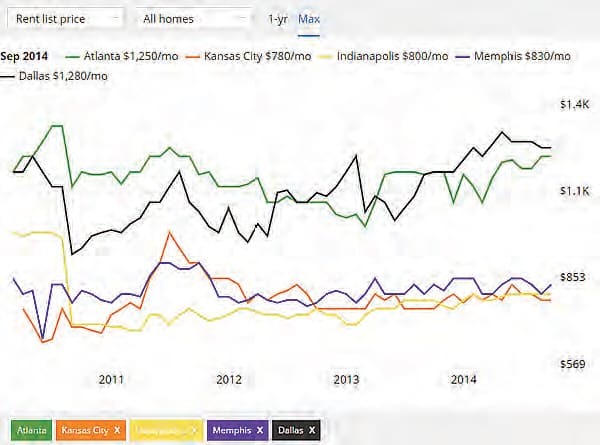 Memphis rentals are some of the most inexpensive in the U.S., with an $825 median monthly price. However, by offering such affordable leasing options, vacancy rates are inherently lower. 4 Indianapolis, IN The median list price for homes in Indianapolis is $120,900, which is significantly less than all three previously mentioned markets. Compared to the nation as a whole, where the median list price is almost $215,000, Indianapolis acts as an inexpensive, entry-level market for amateur investors. There is no data available for Indianapolis sale prices, but 45.9 percent of listings feature price cuts – a strong indicator of a buyer-friendly region. The Indianapolis median rent list price is $800 per month, a fair rate considering how much landlords save on initial purchases. They don’t need to charge high rents in order to pay off mortgages and/or profit. 5 Kansas City, MO Compared to the other cities on this list, Kansas City is extremely affordable. The median price of homes currently listed is only $128,000. Like Indianapolis, there is no data for sale prices in Kansas City. However, 41.7 percent of homes on the market in Kansas City experienced price cuts. The median rent list price in Kansas City is $775. Lower rates tend to attract greater numbers of renters, broadening the pool of potential applicants. While prices vary, all of these markets prove strong opportunities for returns on investments. Whether it takes a few months or a few years depends mostly on the buying and renting competition in the region. Taking into account current budget, future mortgage payments and revenue goals helps narrow options to select the most appropriate investment.